Competitors must be sixteen years of age or under on February 10th 2019. Competitors must be United Kingdom citizens. a. A link to an online video (YouTube/Facebook etc.) (no editing accepted) of the applicant performing for two minutes, on an acoustic kit, (Electronic Kits are not permitted) alone with no other musicians or live musical accompaniment. Only the first two minutes of each video will be viewed. The entrants’ face must be clearly visible. Incomplete documentation will be considered as an invalid entry. The documents will not be returned. All correspondence with the 10 finalists will be by email. Finalists must ensure that they have access to an operational email address to receive instructions from the organisers. The deadline for entries is 15th November 2018. Competitors who reach the final ten (the Finalists) will be notified by e-mail and telephone. Each finalist must supply the organisers with a 200 word biography (in Word format) and a good quality head and shoulders photograph of themselves within 48 hours of learning they are in the finals. or supporters or anyone representing a Finalist or Finalists. A Finalist may be disqualified for a failure to register in the finals on time, through the falsification of age or other important facts or by breaking any other of these rules. Each Finalist must register on the day of the finals at the venue and time stipulated. Once registered on the day of the finals, Finalists will not be able to make direct contact with the audience or members of their family, friends, or supporters until the end of the competition. For clarification, the end of the competition will be the point when the winner is announced. Finalists will not be permitted to keep their mobile telephones with them once registered until the end of the competition. Copies of either a Birth Certificate with photo ID or a Passport are only acceptable as proof of age. Travelling or other expenses will be covered by Finalists. The organisers will not be responsible for any expenses whatsoever. The order of playing for the finals will be determined by a draw system to be carried out in the presence of the Finalists on the day of the finals. slightly before or the after the permitted two minutes for the solo. Finalists who extend their solo beyond this reasonable allowance will have points deducted from their overall total. Finalists will be marked out of 10 on six separate competencies. With the agreement of the judging panel, the finalist with the highest score will be the winner. A five piece drum kit, hi-hats, 2 crash cymbals, a ride cymbal, cowbell, timbalito, hardware and stool will be supplied by the organisers. Finalists may only use their own bass drum pedal (single or double) and sticks. The competition Director is entitled to take decisions on any organisational or judging matters beyond the competence of the Judging panel. These decisions shall be final in all cases. The winner will receive a plaque recording their achievement. 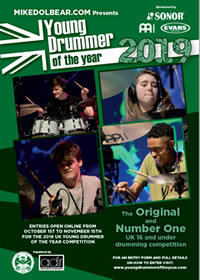 By entering the competition, all entrants and their parents / guardians agree to the finalists’ name and image being used in any promotional material for the Young Drummer of the Year competition, mikedolbear.com or the competition sponsors for this or any future years. The Winner agrees to play the current year’s sponsors’ products at major drumming events during the year they win the competition. The winner agrees that some magazine, radio and television publicity they may be offered during the year, in which they hold the title of Young Drummer of the Year, may be managed through mikedolbear.com. mikedolbear.com will not charge management fees to the winner nor request any percentage of any fees which the winner may receive as a result of such publicity. liability for any loss or damage whatsoever and howsoever incurred by any competitor their family, friends, or supporters or anyone representing a competitor or competitors including any consequential, special, secondary or indirect loss or damage or any damage to name, brand, goodwill or profits whether arising in tort, contract or otherwise, and arising out of or in relation to or in connection with the Young Drummer of the Year competition. mikedolbear.com reserves the right in its absolute discretion at any time and without notice to remove, amend or vary any of these rules without notice.